Introducing the Coffey Insurance Blog! We are excited to start this blog and share helpful tips and recommendations for your insurance needs along with some fun and humor of everyday life! :) The Coffey Insurance Agency was established in 1958 by Conrad J. Coffey and since the beginning we have had the same core set of goals, to be the right people, providing the right coverage and offering the right price to our clients. We strive to provide customer service excellence and offer competitive rates to guarantee our clients the best price! We would like to introduce our mascots and loving pets Lady Winifred and Phineas. 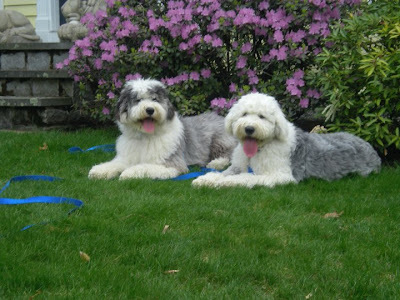 They are 1 ½ year old brother and sister Old English Sheepdogs, flown to join our family from a wonderful breeder in the Mid-west. 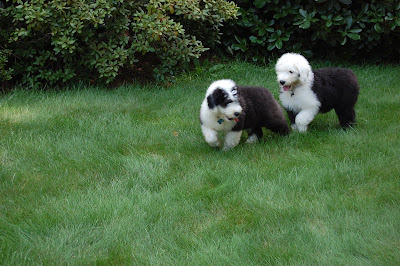 Winnie and Phinn were born in June 2010 and officially journeyed to New Hampshire in September 2010. Throughout our blog Winnie and Phinn will be giving helpful insurance tips and supplying their “paw of approval”. Here are some photos from Winnie and Phinn’s arrival! 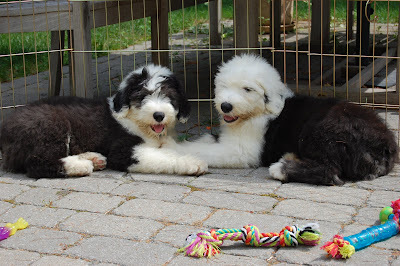 To give a little background about the breed here are some facts about Old English Sheepdogs. We think they are the best breed ever…but of course our opinions are slightly biased! 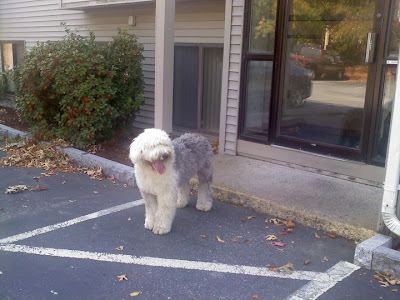 :) Sheepdogs are described as a friendly and “clown” like dog. They yearn to be part of the family and are great with children. Sheepdogs have a strong herding instinct and they need calm and confident leadership, they do best with clear rules and commands. They may be a little lazy, but don’t think they are couch potatoes because they are a very active breed and love daily walks, runs and exercise. 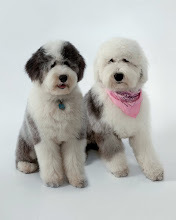 Their cute shaggy look might melt your heart but don’t be fooled of the maintenance sheepdog’s coats require consistent grooming and attention! They have coarse long hair that needs to be brushed at least weekly to avoid mats…that are no fun for dogs or owners! :( Many owners have their own grooming tables at home to brush in between professional grooming. It has been great watching Winnie and Phinn grow and see their personalities develop. Having littermates in the family definitely adds to the fun! We have learned that Winnie wears the pants in the relationship she rules the roost with Phinn. If we didn’t separate them at meal times Ms. Winnie would probably never share a bite with her dear brother Phinn. She also likes to get first dibs on most things especially stuffed toys and if they last long enough Phinn will get a turn. They love, love, love to chase each other all over the yard and sometimes when we are not looking play tag in and out of the shrubs! Relaxing after a game of tag. Winnie and Phinn sometimes take a break from their hard lives of daily naps and sun basking to join us for a days work at the Coffey Insurance Agency. 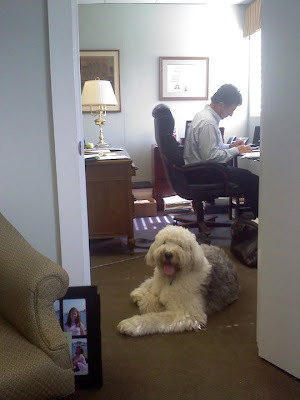 They love taking trips to our seacoast office which is located at 410 The Hill in downtown Portsmouth. Phinn especially loves to take a walk down Market St. when he first arrives to stretch his legs and give free licks and kisses to anyone that stops to pat him. I suspect he is aware of his cuteness! :) He often enjoys yummy treats and fresh drinks of water from the great dog friendly shops downtown. Winnie our number one secretary loves to spend the day with Jay at our Nashua location at 2 Wellman Ave. She often settles down for a snooze in his office at the foot of his desk and we have wake her up from her long winter’s nap to remind her the phone is ringing! Winnie at work with Jay. We look forward to having our friends and followers check back to our blog frequently! Winnie and Phinn have many interesting things they would like to share! Are there any insurance topics you'd like to learn more about? If so, leave Winnie and Phinn a comment below!